In recent years, schools and educators in Los Angeles, as well as those across California and the nation, have found themselves engaged in an at times contentious debate about the role and impact of charter schools in public education. Among educators and advocates, there sometimes has emerged a bitter divide between those who see charter schools as sources of inspiration, innovation and opportunity, and those who view them as a force focused on dividing and conquering educators and public schools, bent on the undermining of public education. The conversation has been at times, a hard one, with folks choosing sides and taking rigid positions. But this week, maybe, just maybe, there has been a crack in the ice, the beginnings of a change in the conversation. On Wednesday, July 25th in a conference room at the California Endowment in downtown Los Angeles, a mix of educators, researchers, advocates and community leaders gathered for a forum hosted by We Choose All, a small coalition of organizations that has been working to inform public debate about the challenges and changes facing public education in Los Angeles, and to promote interest in supporting an educational system that provides high quality education for all students. The crowd ran the gamut from LAUSD Board president Monica Garcia and UTLA president Alex Caputo Pearl, to charter school principals and advocates, to foundation and nonprofit leaders. During their daughter’s freshman year of high school, Paul and Joy Orton spent afternoons describing biology diagrams and illustrations to her. She is blind, and the materials given to her in class were not in a format she could read. Their daughter had no trouble understanding the material, but she was dependent on her parents. She wanted to learn on her own, like her classmates did. Her parents successfully lobbied their northern Alabama district for a Braille biology textbook. “She put her hands on the diagram and said, ‘Oh! I get it now,’ ” Joy Orton says. “It was a really powerful moment that the diagram was helpful to her, but only if it’s tactile or accessible.” But the textbook didn’t solve everything. There were still the daily slide presentations. The slides that accompanied biology lectures also included diagrams and illustrations. Theres no textbook for the class, so the presentation was the main source of information. With no alternative text describing the images, their daughter’s screen reader couldn’t recognize them. The family tried to work with school administrators, but the situation did not improve. So they filed a complaint with the U.S. Department of Education’s Office for Civil Rights. The office, OCR for short, is responsible for reviewing cases that allege that students do not have equal access to education. The Ortons’ complaint outlined the issues with the slides and emphasized their desire to improve accessibility in their daughter’s school district. Democrats in the U.S. House of Representatives on Tuesday introduced their proposal to reauthorize the Higher Education Act, the main legislation governing federal higher-education policy. Their bill, called the Aim Higher Act, presents a stark contrast to the Republican alternative, the Promoting Real Opportunity, Success, and Prosperity Through Education Reform Act, or the Prosper Act, which was unveiled last year and currently awaits action on the House floor. Legislators in both parties agree that the higher-education system is flawed. Access to affordable four-year degrees is limited, and students struggle with loan debt. The two bills suggest changes in several of the same programs, including simplifying the Free Application for Federal Student Aid, holding colleges accountable to their goals and their students’ educational outcomes, and enhancing access for more financially vulnerable students. But how the bills would go about making those changes differs greatly. Neither party’s proposal is likely to become law, especially in an election year with many higher legislative priorities, so the long-delayed reauthorization of the law might be years away. Here’s how the two parties’ wish lists stack up, based on their respective bill summaries. A judge has given the go-ahead to a lawsuit accusing California of violating the rights of hundreds of thousands of minority and poor children to equal access to educational literacy. They also said 11 of the nation’s 26 lowest-performing large school districts are in California, which ranks near the bottom of the states in both school funding and test scores. The state Department of Education sought to dismiss the suit, saying California has one of the nation’s strongest programs to serve low-income students and spends more than $10 billion a year on programs for English learners. They also noted a state appeals court ruling in 2016, in a separate case, that found the California Constitution does not guarantee a right to public education at any particular level of quality. High school seniors in nearly three dozen states walked across the graduation stage last month to receive a diploma with a unique distinction that signifies they are even better positioned for success: a Seal of Biliteracy. That’s because in today’s global economy and multicultural society, the skill of being bilingual is becoming increasingly valuable in the eyes of colleges and employers. In fact, a recent study from the New American Economy showed that demand for bilingual workers more than doubled between 2010 and 2015. The growth in the number of states offering a Seal of Biliteracy — a designation on a student’s high school diploma demonstrating their proficiency in both English and another language — is evidence of this trend. California was the first state to adopt the seal in 2011. As of today, the seal has been implemented in 34 states with more adopting it each year. As the state seeks even greater success, State Superintendent of Public Instruction Tom Torlakson recently issued a Global California 2030 plan, which sets a goal of tripling by 2030 the 46,952 Seals of Biliteracy that California awarded this year, and to quadruple the number of dual immersion schools over the same period. It also calls for increasing the number of state-approved bilingual teacher preparation programs, along with the number of bilingual teachers they produce. Some school districts are preparing for more immigrant students than usual this fall due to children who were separated from their parents at the border and others who came alone and are settling in their areas. Alberto Carvalho, superintendent of Miami-Dade County Public Schools in Florida, wrote Homeland Security Secretary Kirstjen Nielsen in June about not being told that 1,000 children were being housed at a shelter in his area. It isn’t clear if the children were separated from parents or came unaccompanied, or both. “We could have an influx of kids entering our schools, that’s why the secrecy around this issue has been uncomfortable on so many levels,” Mr. Carvalho said in a recent interview with The Wall Street Journal. Mr. Carvalho said federal officials responded to his letter but by last week hadn’t set a date to discuss, as he requested. Mr. Carvalho, who came to the U.S. as an unaccompanied minor at 17, said he is worried about the emotional trauma the children are going through having “walked their footsteps.” A Homeland Security Department spokesman didn’t respond to a request for comment on education matters concerning the detained children. Trauma-informed care, which focuses on sensitivity to students’ experiences, and state support for mental health have paid off big in Wisconsin, state and local officials told U.S. Secretary of Education Betsy DeVos and other members of the Federal School Safety Commission at its second field hearing, which took place in Adams, Wis., on Tuesday. The Badger State’s system of supports for mental health took center stage at the hearing, which included a class tour and roundtable discussion at Adams-Friendship Middle School. The commission, chaired by DeVos, was set up in the wake of the massacre at Marjory Stoneman Douglas High School in Parkland, Fla. The commission also includes Alex Azar, the secretary of Health and Human Services; Kirstjen M. Nielsen, the secretary of Homeland Security; and Jeff Sessions, the attorney general. Only DeVos and Azar were on hand for the field visit. Mental health has been a big theme for the safety commission. Its first “field visit” was focused on Maryland’s use of Positive Behavioral Supports and Interventions, or PBIS. So far, the commission hasn’t visited a school that arms its teachers, even though Trump has held that up as a potential solution to combatting school shootings. DeVos has said that the panel won’t be looking at the issue of firearms, except in limited circumstances, to the chagrin of many educators. Have you ever paid your kid for good grades? Have you driven to school to drop off a forgotten assignment? Have you done a college student’s laundry? What about coming along to Junior’s first job interview? These examples are drawn from two bestselling books — How to Raise an Adult by Julie Lythcott-Haims and The Gift of Failure by Jessica Lahey. Both are by women writing from their experiences as parents and as educators. Lahey is a teacher and a writer for The New York Times and The Atlantic, currently at work on a new book about teens and addiction. Lythcott-Haims was the longtime freshman dean at Stanford; in 2017, she published the memoir Real American and is working on a sequel to How to Raise an Adult about “how to be an adult.” The books make strikingly similar claims about today’s youth and their parents: Parents are “too worried about [their children’s] future achievements to allow [them] to work through the obstacles in their path” (Lahey) and “students who seemed increasingly reliant on their parents in ways that felt, simply, off,” (Lythcott-Haims). It’s technically summer vacation, but about 6,000 kids from Baltimore City Public Schools will spend at least a portion of their break in a school building. And more than a third of them are getting their summer doses of math and literacy instruction by way of the arts. Around the country, most elementary school students’ math and reading ability stops progressing over the summer, and kids from low-income families are particularly at risk of slipping backwards. While students of all socioeconomic classes tend to learn at about the same pace during the school year, the impact of summer learning loss is cumulative, and low-income kids can be as many as three years behind their peers by fifth grade. Baltimore is combating that trend. Its Summer Arts and Learning Academy, for elementary schoolers from high-poverty schools, has been particularly effective at minimizing summer learning loss, as measured by reading and math assessments in the spring and fall from one school year to the next. The academy is run by Young Audiences, a Baltimore nonprofit dedicated to arts-based education. And students seem to love it. “Ask how we’re doing and mean it. Ask the follow-up question, even when we brush you off the first time. And be willing to listen to the answers.” If you want to know what young people need to succeed, it turns out you should just ask them. They’ll tell you. And they’ll make it clear that neither miracles nor miracle workers are required to help more students graduate from high school and be prepared for the future. Over the past dozen years, the national high school graduation rate has increased from 71 percent to 84.1 percent. The young people living in that 13 percentage-point difference are the kids who can and should graduate, but in past years too often didn’t. Many like them still don’t. As leaders of national organizations focused on helping all students stay in school and graduate, we met recently with young people in Allentown, Pennsylvania, and Washington, D.C. We wanted to hear from recent high school graduates about what works, what doesn’t, and how we might do more. The Advanced Placement program is engaged in a tenuous balancing act. The program aims to serve more students from marginalized backgrounds whose schooling experiences have exposed them to few rigorous learning opportunities. At the same time, it seeks to engage students in challenging, college-level curriculums, thereby enhancing their likelihood of postsecondary success. The goals are admirable in an era when more students from a variety of racial and socioeconomic backgrounds entertain college-going dreams. However, the dual goals of serving more students and maintaining college-level expectations have proved difficult to pursue in tandem. Scholarly research has illuminated persistent barriers that constrain the ability of the AP program to achieve its goals. Schools can benefit from these insights, and researchers too can benefit from more engagement with AP programs as they are implemented in schools. By integrating research and practice, these programs can better serve students from marginalized backgrounds. The failure to provide girls with education through secondary school comes at a high cost to their health and well-being—and at a staggering cost to the world economy, to the tune of $15 trillion to $30 trillion in lost earnings and productivity. That’s the calculation of the World Bank, which in a new study gauges the benefits of education not only in higher wages for women over their lifetimes, but also in areas such as girls not having children as teenagers, lower infant mortality, and girls’ avoidance of violent relationships. The biggest economic payoff comes in the developing world, where income and school levels are lower and girls and women potentially reap greater benefits, said Quentin Wodon, a lead economist at the World Bank and the lead author of the report. Many relatively poor nations have already made progress in creating near-universal access to more basic education, at the primary school level, according to the World Bank. But a much bigger economic and societal upside comes from bringing girls farther along educationally, and giving them access to secondary education, the study finds. More than 160,000 students are enrolled in Los Angeles charter schools today—far more than in any other city in the nation. The four-fold increase over the last decade in Los Angeles charter school enrollment has coincided with declining enrollment in the Los Angeles Unified School District (LAUSD). As a consequence, more than ¼ of all Los Angeles K-12 students now attend charter schools. A group of philanthropists and advocates under the banner “Great Public Schools Now” has proposed to expand charter enrollment much further. In 2015, the group called for doubling charter enrollment such that, by 2022, as many students would attend charter schools as district schools. In early 2016, representatives of UNITE-LA, In the Public Interest, the Advancement Project, the Learning Policy Institute and UCLA IDEA came together with the goal of informing public debate about these dramatic changes in Los Angeles education. We called ourselves, the “We Choose All” coalition, in recognition of our shared interest in supporting an educational system that provides high quality education to all Los Angeles students. We entered the conversation recognizing the wonderful work of Los Angeles educators in both district and charter schools as well as the civic energy of labor and community leaders, advocates and philanthropists who grappled with one another to define the future of Los Angeles schools. Yet, we worried that “reform” that emerges without systemic planning and public deliberation could not meet the needs of all Los Angeles students. Further, we believed that such “reform” was likely to further erode institutional stability, cross-sector civility and public confidence. As they attempt to score political points instead of filling Americans’ basic needs, congressional Republicans continue to pursue funding for the deeply flawed D.C. private school voucher program. Studies have consistently shown that these vouchers have not improved educational outcomes and suffer from program management and accountability failures. Yet, both the House and Senate want to fund these vouchers for yet another year. The Senate has even proposed increasing D.C. voucher funding. People For the American Way will continue to stand up for D.C. students and against voucher schemes that undermine public education. Accordingly, PFAW joins our National Coalition for Public Education (NCPE) allies who oppose the Senate’s current proposal. You can download our letter here. For months after federal agents raided the offices of a Los Angeles charter school network, seizing documents and electronic records, the Celerity Educational Group tried to overhaul its image. The nonprofit cut financial ties with its parent organization and replaced its chief executive. It launched a rebranding effort to distance itself from allegations of financial wrongdoing that have hovered for more than a year. 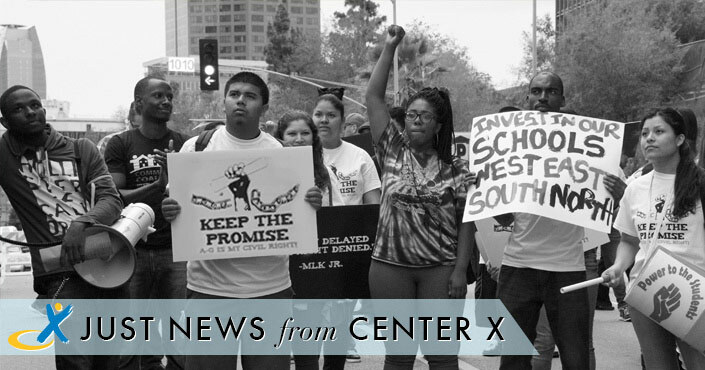 But in a sign that all is not well, the charter management organization made the decision last week to close one of its seven schools in Los Angeles County: Celerity Rolas, in Northeast L.A. In a letter to parents, Nadia Shaiq, the group’s CEO, said that Rolas had been unable to attract enough students to justify the costs of keeping it open. “Closing a school is always a disappointment for our entire community,” Shaiq wrote. “But keeping the school without the enrollment necessary for a balanced budget would threaten the overall health of our other schools, impacting students, parents and employees.” A spokesman for Celerity did not respond to requests for comment. Sylvia Hernández is a celebrated master quilter who creates work addressing community and human-rights issues.